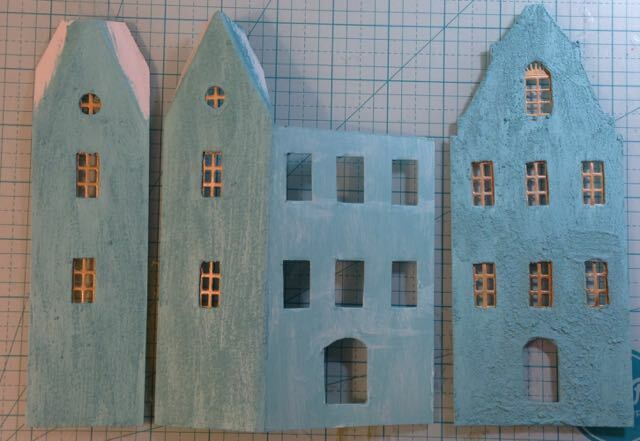 I’m now making a Putz house based on the delightful houses along the canals in Amsterdam. These houses were built during the Dutch Golden Age in the 1600s when there was an influx of both wealth and people into the city of Amsterdam. In order to accommodate the people and the goods, 3 canals were dug to allow transport of goods and to provide more space for homes in the city. Many of the homeowners were merchants who actually used the house as their home and business. One very interesting thing about these houses is that most of them have a pulley system attached to a beam at the top of the house. This made it possible to unload barges easily and store merchandise directly in the homes. I did not include the beam in my design though. All the shapes of these houses are so appealing. I just had to make a house based on these houses. One of these days I am going to make a blue and white delft house like the ones that KLM, the Royal Dutch Airline, presents to its business travelers. 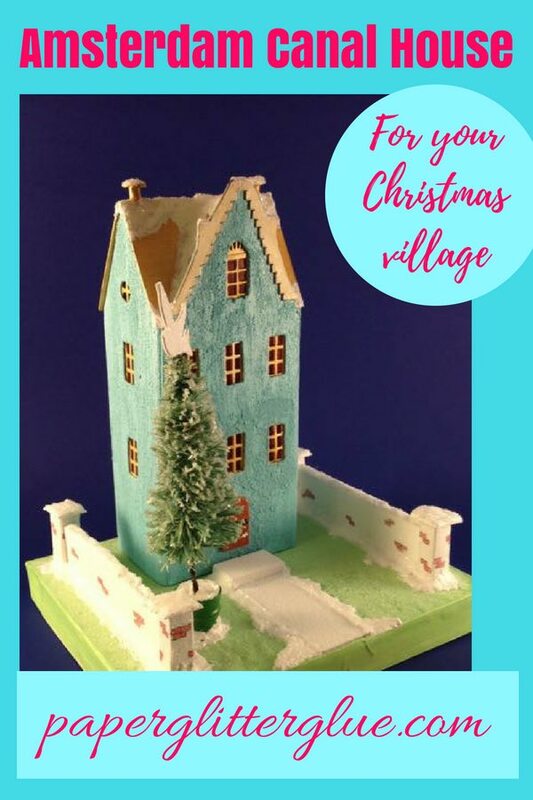 Addendum – Now there is a pattern for a variation on the Amsterdam canal house with a free pattern. But for now here is the design for this house – my front template and the rough sketch and pattern it was based on. 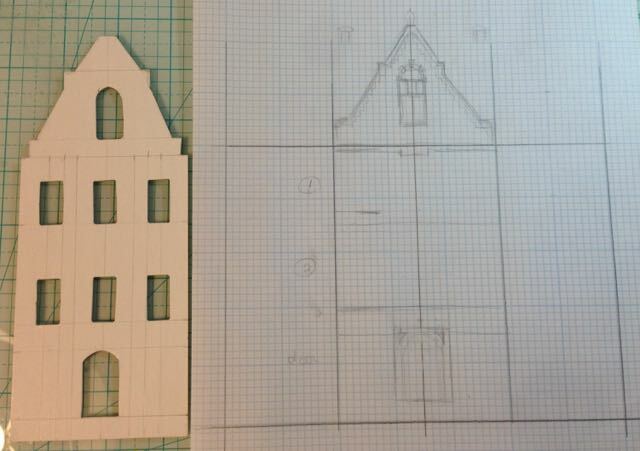 Here is the initial drawing for the facade on the Amsterdam Canal Putz house and the cut out template for the front piece. And below are the main pieces cut out and painted. I painted this little cardboard house with a wonderful Martha Stewart acrylic paint called “Surf”. I mixed in sand to make the paint look like plaster and have more depth to it. There is a much thicker coat on the front piece partly because I had to cover up some mistakes. Notice that I cut out larger windows on the piece that supports the facade. That’s because it is sometimes hard to line everything up perfectly. So when I have supporting pieces of cardboard, I cut the openings larger just to make sure they don’t show. The windows are painted gold and glued on the back of the house. Most of the time I put them in the front, but sometimes I just glue them behind the windows. Amsterdam Canal Putz house in progress. Here is the finished Amsterdam house. Amsterdam Canal Putz house? Pin to your favorite crafty Pinterest board. I love the shape of this house! I think this is going to look really cool especially when I get the roof on it. Thank you for noticing. I hope you are having a good season.